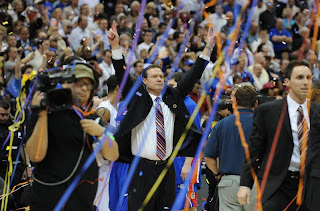 On a completely unrelated note, I'd like to give a shout-out to the 2008 NCAA National Champions, the Kansas Jayhawks! Way to go!!!! Unbelieveable! I was ready to give up with 2 minutes remaining when we were 9 points down, but we pulled it out! I guess destiny had something in the cards for us afterall! Rock Chalk Jayhawk GO KU! !